Covering the period from 1820 to 1950, the time when the first Fords came to America until shortly after the death of Henry Ford, The Fords of Dearborn is a series of illustrated stories about the various branches of the Ford family, together with accounts of some of Henry Ford’s unpublicized projects. 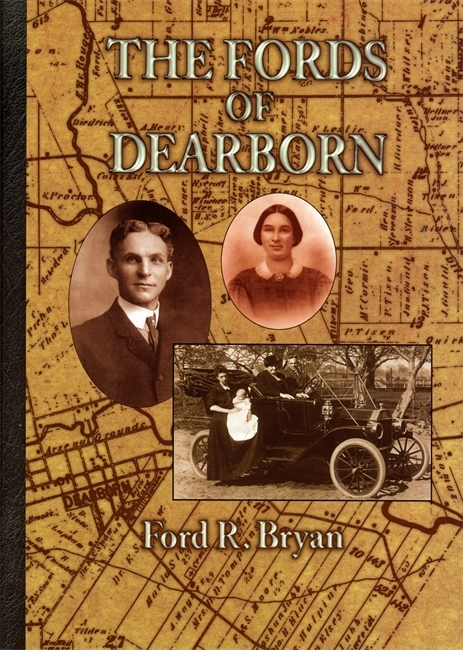 Author Ford R. Bryan—who was himself a member of the Ford family of Dearborn—provides authentic and fascinating information about the Fords based almost entirely on information and photographs contained in the Ford Archives of Henry Ford Museum & Greenfield Village. From family bibles, family legend, correspondence, and the historical archives of Dearborn, he traces the family history from England to Ireland, then to America, and in 1832 to the wilderness of the Michigan Territory. The Fords of Dearborn includes genealogical tables and more than 125 illustrations depicting family members, their farms, their homes, and their relationships. This second edition, in a new design in larger format than the previous edition, includes an index that will be appreciated by both readers and genealogists. Ford R. Bryan joined Ford Motor Company as a spectrochemical analyst following World War II. Over the course of thirty-three years, he would move on to the Ford Scientific Laboratory, publishing more than seventy technical papers on optical spectroscopy. Following his retirement from Ford, he became a volunteer at the Henry Ford Museum & Greenfield Village. His yen for writing led him to the Ford Archives, where he found a gold mine of material about his own family and about his favorite subject, Henry Ford. He has written many books about Henry Ford, including Rouge: Pictured in Its Prime; Friends, Families & Forays; Clara: Mrs. Henry Ford; Beyond the Model T: The Other Ventures of Henry Ford; Henry’s Attic: Some Fascinating Gifts to Henry Ford and His Museum; and Henry’s Lieutenants (all published or distributed by Wayne State University Press). I heartily commend this work. You will discover more that is truly new about the Fords inside this book than in many a volume twice the size. these are the bricks of history - crafted, meticulous, accurate and strong.